Towering new cranes are coming to the Port of Oakland to handle the latest generation of megaships. The Port said yesterday that its largest marine terminal would install three 300-foot-tall gantry cranes late next year. The three cranes would go to Oakland International Container Terminal on Oakland Estuary. A $30 million order for the cranes was submitted last week, the Port said. It added that the new cranes would be the tallest on the West Coast and perhaps, the nation. The Port said the new cranes would be able to load and unload the world’s largest container ships. Megaships can be up to 1,300 feet long and carry nearly 23,000 cargo containers. Containers are stacked up to 12-high above deck on the largest vessels. Taller cranes are required to reach the top of the stacks. SSA Terminals, the operator of Oakland International Container Terminal, ordered the cranes from Shanghai-based ZPMC. SSA said it expects the cranes to be delivered in 18 months. The cranes, which could be 440-feet tall with booms upraised, would be delivered by ship from China. They’d arrive only partially assembled to assure clearance under the San Francisco-Oakland Bay Bridge. According to SSA, its new cranes would have a lift height of 174 feet above the dock. They would be able to reach 225 feet across a ship’s deck. The terminal operator said its new workhorses would make it quicker and easier to get containers on and off vessels calling Oakland. A $14 million project to heighten four cranes in 2018. 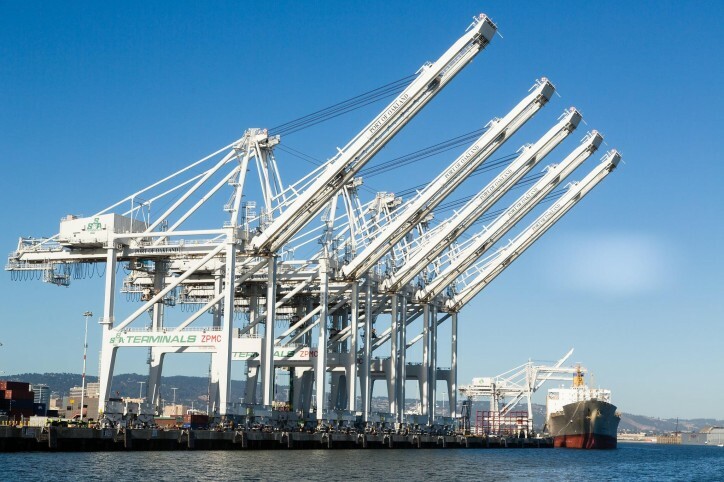 SSA operates 10 cranes at Oakland International Container Terminal. The Port said it would remove three older cranes from the line when new ones are installed.